Northampton County, Pennsylvania, with Easton, its county seat, the seventh county established in Pennsylvania, in 1752, was an Indian purchase, based "on a (1737) walk," which led to the war with the Indians in 1755. It is situated in the east central part of the state, between the Kittatinny and South Mountains, and is watered by both the Lehigh and Delaware rivers. The Scottish-Irish were here by 1732, followed by more Scottish-Irish, Moravians, Mennonites, and other Germans. This was the land of David Brainerd, missionary to the Delawares, and the scenic Delaware Water Gap. The Mennonite farmers were chiefly in Allen, Lower Mount Bethel, Washington, and Saucon townships. At Hellertown a union schoolhouse was built probably in the middle of the 18th century and a second in 1802, deeded to Samuel Kauffman for "the Menoists" and Samuel Rothrock "for the Baptice Societice." This was burned down and rebuilt in 1854 and again in 1891. Mennonite names are common in the adjoining cemetery. In Allen Township at Siegfried's Bridge on the Lehigh River a half acre of ground was purchased by Jacob Baer, Jacob Heston, John Ziegler, and Samuel Landis, and with John Ziegler and Samuel Funk as a committee, a school-meetinghouse 26 x 30 ft. was built on it in 1802, for the purpose of leading the children "from the home to the school, the school to the church, and from the church to Heaven." In the first half century the membership varied between 60 and 100. The ministers included Valentine Young, Samuel Musselman, Christian Bliem, John Bechtel, William Gehman, John Oberholtzer, Christian Clemmer, David Homing (1806-1881), William Shelly, Henry Diehl, Jonas Musselman, and Samuel Moyer. In 1860-1880 the membership dwindled and services were held every four weeks by Samuel Landis, Lewis Taylor, and Jonas Y. Shultz. The cemetery contains the Mennonite names of Bliem, Bechtel, Coppes, Funk, Gerhard, Geisinger, Heistand, Baer, Landis, Latshaw, Scherrer, Seiple, Swartz, Young, and Ziegler. In August 1884 efforts were made to repair the building and improve the burying grounds. By 1908 the building was sold to the school board, but apparently never used as a school. Siegfried's meetinghouse was built in the borough of Northampton, with Jacob Showalter, Sr., as leader. By 1771 Joseph, John, and Jacob Showalter, Jr., with Peter Bassler moved to Lancaster County, that they might live with co-religionists. With a congregation in 1798 in Mount Bethel Township, a union log house was built in Bangor in 1806 and one of brick in 1822. In 1849 in Lower Mount Bethel Township another was built. Northeast of Bangor, near Richmond, was the Rothrock meetinghouse, torn down in 1916. Although six Mennonite churches once stood in Northampton County with a numerous Mennonite pioneer group, their descendants moved away or left the Mennonite Church. The only services of this group in the 1950s held in the county were the two missions started at Bethlehem and Easton after 1951 by the Franconia Mennonite Conference, and at Bender in 1955 by Lancaster Mennonites of the Weaverland congregation. 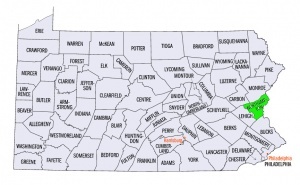 Northampton County has always been a strong hold, however, of the Mennonite Brethren in Christ Church of Pennsylvania (now Bible Fellowship Church). Its second largest congregation in Pennsylvania is [[Bethlehem Mennonite Brethren in Christ Church (Bethlehem, Pennsylvania, USA)|Bethlehem]] with 376 members, founded in 1887. Other congregations are Easton with 162 (20 members in 1911) members, Nazareth with 58, Northampton with 38, and Walnutport with 53. Their total in the county in 1956 was 647 baptized members. Cassel, Daniel K. History of the Mennonites : historically and biographically arranged from the time of the Reformation, more particularly from the time of their emigration to America, containing sketches of the oldest meeting houses and prominent ministers ; also their confession of faith, adopted at Dortrecht, in 1621. Philadelphia: Daniel K. Cassel, 1888. Egle, William Henry. An illustrated history of the commonwealth of Pennsylvania, civil, political and military, from its earliest settlement to the present time, including historical descriptions of each county in the state, their towns, and industrial resources. Philadelphia, PA: E.M. Gardner, 1880. Wenger, J. C. History of the Mennonites of the Franconia Conference. Telford, PA: Franconia Mennonite Historical Society, 1937. Landis, Ira D. "Northampton County (Pennsylvania, USA)." Global Anabaptist Mennonite Encyclopedia Online. 1957. Web. 26 Apr 2019. http://gameo.org/index.php?title=Northampton_County_(Pennsylvania,_USA)&oldid=93132. Landis, Ira D. (1957). Northampton County (Pennsylvania, USA). Global Anabaptist Mennonite Encyclopedia Online. Retrieved 26 April 2019, from http://gameo.org/index.php?title=Northampton_County_(Pennsylvania,_USA)&oldid=93132. Adapted by permission of Herald Press, Harrisonburg, Virginia, from Mennonite Encyclopedia, Vol. 3, pp. 922-923. All rights reserved. This page was last modified on 23 August 2013, at 14:14.